A few weeks ago I had the pleasure of attending a presentation by Matt Krehbeil from Achieve, Inc., the nonprofit organization that coordinated the second phase of the Next Generation Science Standards development process. As a former high school science teacher, Matt did a great job connecting to a roomful of teachers. He presented us with a phenomenon and asked us to break into groups of four and explain it. The phenomenon was “why does a toilet plunger stick to a table?” Very few of the science teachers in the room were able to develop a comprehensive explanation, but we all managed to come up with critical pieces, such as “air is made of particles”, and “the collisions of particles against a surface create a net force”. He pointed out that the goal of the question isn’t necessarily to generate a complete answer, rather it is to get students to talk about air as particles and how they might behave. 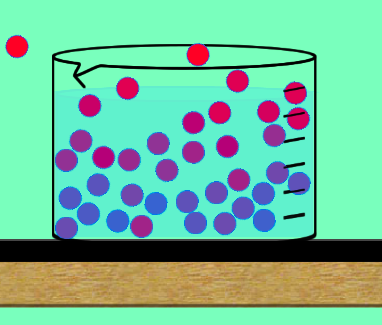 Once they saw the simulation, there was a flurry of activity as students realized they could explain what was going on as the high energy particles (red) left the beaker, leaving behind the lower energy particles (blue). It was a great “Eureka!” moment for the students, and I haven’t had to talk about “heat” as a mysterious quantity ever since. “Thermal Energy” now has physical meaning to them. I don’t think I will ever go back to teaching it the old way. Have you tried the “Evaporative Cooling” simulation? If so, let us know how it goes in the comments below!